I suppose the longer I put off reviewing a book, the less I realize I have to say about it. Especially since there really wasn't much to say about it to begin with--at least not much more than what I've already written in my pre-review thoughts (see link above). So I guess, in short, Kalahari was an interesting and exciting read once the story got going. And I might even chance to say that it is the most enjoyable of the three Corpus books--at least in my opinion, it is. But again, that is after the story got going, and after I chose to let go of how our band of teenagers end up in the life-or-death abandonment problem that they were left in in the first place. It took a bit of letting go, really, but after the letting go was accomplished and I moved on, the rest of the book wasn't bad. But to be totally honest, despite the fact that this book is a work of fiction, who thought it was a good idea for the only two adults in this entire situation to run off in pursuit of dangerous poachers, leaving the teenage daughter in charge of five other teenagers? And taking all the supplies with them? And taking the only working vehicle with them? And taking pretty much any possible form of survival with them? Because, I get that the chances of things going wrong are nil, since everyone was saying that the area is a rather peaceful one. But things CAN go bad nonetheless. And agenda or no agenda, passion or no passion, a responsible adult DOES NOT take the only other adult and the only vehicle and run off leaving a bunch of kids to fend for themselves in the middle of nowhere. Really, the snobby rich kid was kind of a jackass, and kind of annoying, but he got one thing right: Sarah's father was absolutely irresponsible for running off like that when he's got a whole group of kids he was supposed to be watching after. To be totally honest, after that first part, the rest of the book really was quite exciting. As I'd stated, it reminded me a little of a Michael Crichton novel, if only because we get a group of strangers together and throw them into an environment where things can and DO go wrong, thus pitting them into a life or death journey to find a way out of said life or death journey. It's just, this book is about a bunch of teenagers (who have way too much dramatics, really), has a lot less death, and the way in which the kids are thrown into danger could have been better handled. I DO like that, no matter that the rest of the teens were angry with Sarah and her father for what happened, they still conceded that Sarah was the strongest and best suited to get them out of their situation. So even with all the angry and the emotions and the dramatics being thrown around, they still followed her instructions even if reluctantly. I also like that they eventually learn to work together, although Sarah was the one who lead them where they needed to go. I liked that Sam (the love interest) wasn't made out to be the perfect teenage hero--he was there as support and followed Sarah's lead instead. I liked the constant danger and the survivalist story line. I even learned to like the rest of the group: Avani, the brainy know-it-all; Joey, the jokester; Miranda, the diva; and Kase, the rich snob. And I also loved, as per usual with Jessica Khoury, the detail and the descriptions and the setting. 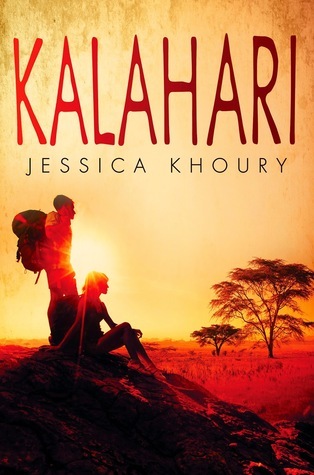 Kalahari isn't the best of books, but it IS written beautifully. And the kids might have been rather one-dimensional and non-outstanding, but they were an interesting group to follow. And the ending was quite satisfying even if a bit rushed. All-in-all, Kalahari was quite the enjoyable read, even though I have the distinct feeling that I maybe am giving it more star rating than it actually deserves (I have half the mind to drop it half a star for lots of reasons). But that's my prerogative. This book really just gave me a Michael Crichton feel; like something he might have written, but with adults with the proper skill set to be in the Kalahari in the first place, and a science fiction aspect that was a bit more tangible. I agree, the animal thing was a bit over, even if I liked the whole "virus gets out of hand" angle. I think what I liked more about this book than Vitro might have been the survivalist angle as well... or it's entirely possible my reading mood was just in a different place. I DO recommend Origin as well, as I feel like it was an excellent debut by Jessica Khoury. And if you might be inclined to read something in more of a fantasy angle, her newest book, Forbidden Wish is by far my favorite of her work. Then again, I'm more drawn to fantasy.